When it comes to light switches, they come in different types and designs. As a homeowner, you need to know the various types of switches and designs to ensure that when the time comes, and you need to do a replacement, you can identify the right electrical light switches to buy. Below is a look at some common light switches. 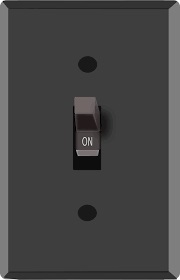 This is the most common switches found in our homes. They use a simple on-off toggle to turn the electrical lights on and off from a single location. Flipping the switch on these models will connect or disconnect the circuit. Most of the single-pole switches are marked with on and off settings. Therefore, when wiring this light switch, ensure that it’s wired correctly to correspond with the marks provided by the manufacturer. The switch should indicate on when the lights are on, but not vice versa. The double-pole switches also utilise an on-off toggle and can only control lights from one location. But with the four brass terminals, double pole switches can house two hot wires, which means that these models can switch a 240-volt circuit. The double-pole models also utilise a green ground screw. This type of electrical light switches come in pairs and allow you to turn the lights on or off from two locations. This makes the switches ideal for controlling long hallways. The three-way designs are more complicated than the single and double-pole switches. The hot wire in the tree way designs is connected to the common screw. The remaining terminals are wired to the leads for switches. The three-way switches come with a green ground screw as well. The four-way designs are usually combined with three-way switches to control the electrical lights from three or more locations. You can easily identify the four-way switch by its four terminals. Now when it comes to designs, switches come in a huge variety. For example, you can find the push-button switches, toggle switches, selector switches, proximity switches, photoelectric switches, dimmer light switches, etc. The switch you buy will depend on your needs and also what you can afford. Your electrician will play an important role when you are buying replacement electrical light switches as he/she can guide you on where to buy the switches and also the kind of switch that you need. So, whenever you have a switch that needs replacement, either because it’s blown or outdated, just know the right switch for you before you can make the purchase.